The practice of choosing a word for the year is something I have done for the last three years under the encouragement of the leadership of a local church. The word has served as a point of focus in my walk with Christ. My word for 2016 is New. We celebrate things that are new. As I thought about my word for this year, I was reminded that the Lord celebrates making things new as well. I just listened to a sermon today that said God views each day with the same excitement that we view each year. His mercies are new each and every day. I am made new. You can be too. This statement has gained popularity lately, and is usually reserved for “First World Problems” or when something trivial happens that we need to make light of. I admit, I’ve said it before and got a few laughs. But what about when the struggle IS real? What are we to make of life when we cannot make light of it? Life is tough. This reality is inescapable. There will be seasons when the struggle is real. I have been through a few seasons like that. In fact, I am just coming out of a season like that. For a few months, I was just in a funk. I felt like the Lord was distant and there was nothing I could do about it. Of course I knew this wasn’t the case, but I certainly didn’t feel it. All of the Christian clichés in the world couldn’t help me feel better about my situation. I was struggling. I was suffering. Suffering is part of the Christian experience. Suffering teaches us lessons that may be learned through no other medium. In these moments of pain, suffering, and confusion we are driven to a greater reliance on the Lord. Our faith in the Lord is tested, and forced to grow. We are forced to lean into the Lord and trust that He will catch us in this time. Allow me to share an analogy that helps me visualize this. I went skydiving last September with a handful of friends from my hometown. I was apprehensive at first, but the challenge was just too much for me to turn down. We all speculated on the drive down that our moment of greatest fear would be as we approached the door for our jump. As the plane begin its ascent, reality began to set in. I turned to my buddy Daniel and said “Well, at this point the fastest way down is going to be by jumping.” He agreed, and we both concluded that since we were strapped in, we pretty much had no choice at this point. 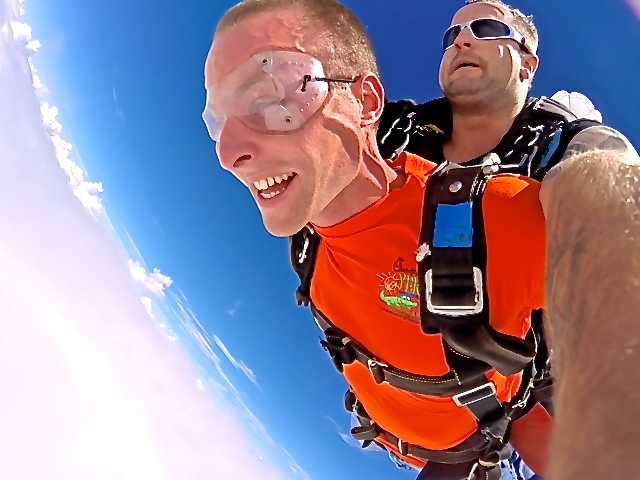 Just think, here I was, attached to a stranger jumping from 15,000 feet into the blue Florida sky. I was relying on this stranger, and our parachute. Needless to say, I survived. I have discovered that our walk with the Lord is a lot like this, especially in the realm of suffering. The Lord often invites us to greater reliance on Him but sometimes He pushes us to the edge so that our only choice is to jump and discover our complete reliance on Him. The latter of these two options is certainly more difficult. It is nice to have the choice to acknowledge my reliance on the Lord as opposed to skydiving into His peace. Either way, the fact is that the Lord is really all I have. I say all of that to make this point: when the struggle is real, it helps to consider that the Lord is likely using that to make you look more like Him. That is the goal after all: to look more and more like Jesus. Recognizing this purpose has not made my struggles any easier, but it has helped me to understand and even be grateful for the experience. I wouldn’t trade them for anything. Pat Tillman, professional athlete turned Army Ranger, died 10 years ago in an attack in Afghanistan. The worst part about this attack is that enemy forces did not carry it out, it was carried out by friendly forces AKA Friendly Fire. This was a terrible tragedy resulting in loss of life, a decrease in combat effectiveness, and utter embarrassment for the US Armed Forces. This incident was a completely preventable occurrence. Of course in the course of battle it is sometimes difficult to discern what exactly is going on, where the enemy is located, where friendly forces are located, etc. Here’s the thing though, friendly fire is not only occurring overseas during war. It is alive and well within the church. Just think about it, we have a very real enemy that is out to “steal, kill, and destroy” and we have Christians battling each other over meaningless things. Now don’t get me wrong, there is a place for debate within the church. Always has been and always will be. People have deeply held convictions and God is beyond our comprehension. There will be differences within the church. What I am saying, is that we need to be careful that we don’t forget our primary mission when we engage in these debates with fellow Christians. Our mission is not to win debates against fellow believers. It is not to be right all the time. It is not to be a theological mastermind. And honestly, from personal experience, I can tell you that most of these debates are a waste of time. The world is full of dying people that need the hope of Jesus. Question- how effective are you going to be at 1) battling the enemy and 2) reaching the lost if you are engaged in a battle with your buddy in the trenches next to you? Answer- Not as effective as you could be. I pray that we would embrace this reality, and devote our full energy to the mission of Jesus Christ. What is the measure of a Man? Is it his bank account? His job title? His athletic prowess? His sexual conquests? His impact on the world? It is all of these things, according to the world at least. Heck, even in the church we are guilty of measuring men based on worldly criteria. I know I am guilty of it all the time. We measure men based on their involvement in the church, the size of their family, their leadership, their gifts. Now don’t get me wrong, all of those things are valuable traits and I am not diminishing them at all. But they are not how we should measure men. So what is the measure of a Man? The degree to which his heart is devoted to the Lord. This is the only measure that God uses. Neither before nor after Josiah was there a king like him who turned to the Lord as he did—with all his heart and with all his soul and with all his strength, in accordance with all the Law of Moses. Clearly the Lord sees things differently than we do. He searches our hearts and knows our thoughts. Josiah was recognized for his total devotion to the Lord, and Asa was disciplined for his failure to rely on the Lord in that particular instance. Other translations of 2 Chronicles 16:9 say that the eyes of the Lord “run to and fro throughout the whole earth”. Just stop and think about that for a moment… God is looking for men with hearts wholly devoted to Him, so he can give them strength!! And finally we see Jesus affirm that the greatest commandment is to completely devote our hearts (along with soul and mind) to the Lord. Men in Scripture were measured by the condition of their hearts before the Lord. And we, men of today, are measured by the same standard. I pray for you and I pray for myself, I pray for all of us as men- May our hearts be wholly devoted to the Lord today. Amen.